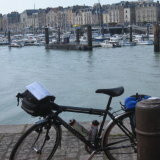 My week-long solo cycling trip to Normandy kicked off with a long, boring day on the train down to Brighton. The only highlight being able to take this picture of The Shard when the train stopped briefly directly below this soaring glass monolith. Tuesday dawned sunny and cool outside my seafront Travelodge hotel, from where I had an easy ten mile ride along the coast to the ferry at Newhaven. I had time for breakfast at Sainsburys before boarding, along with another six cyclists, the 10am ferry and the four hour crossing to Dieppe. Arriving in Dieppe at 3pm (French time), I only had 25 miles flat riding to do to get to my first b&b at Neufchâtel en Bray. The weather was warm and sunny most of the way along my route, the Avenue Verte - a forty mile long, flat, traffic free track similar to the Crook o Lune path. Approaching Neufchâtel the sky suddenly darkened and within a few minutes the heavens opened. Luckily I was just entering the town and spotted a large supermarket where I managed to shelter from a huge thunderstorm, complete with hailstones. 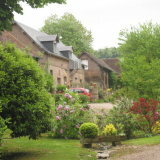 My accommodation for the first night was La Celier du Val Boury, a charming old farmhouse, it was a beautiful place with lots of French character - a good start to a stay in La belle France! The famous impressionist painter Claude Monet bought, later in life, a big house on the banks of the Seine at a village by the name of Giverney. He created the impressive gardens including the water garden with its famous Lilies. Knowing that it is a very popular tourist attraction I thought it a good idea to get there early in the day before the crowds arrived. Oh, how wrong I was! As I was cycling into Giverney at 9-15am, the coaches full of Japanese tourists were passing me at regular intervals. Fifteen minutes before opening time a 9-30 the queue was already well established. I almost turned round and rode off, but I persevered and getting into the gardens I saw it was worth the effort. The gardens are stunning! Despite the crowds I was impressed! I didn't stay long, about an hour, but long enough to get the 'impression,' of the place. Anyone interested in art (me) or gardening (not me) should see this place, it is quite amazing. From Giverney I went further up the river to the chateau of La Roche Guyan where, during World War Two, Rommel set up his headquarters. 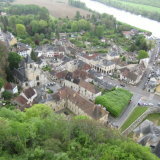 A climb of the 340 stone steps to the very top of the keep was worth it for the views over the town and river. Day four was to be a 'transition day'. 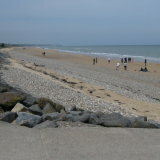 Around 80 miles across country to get me to the next area that I was interested in, the D-Day beaches. As I expected, there was not much of interest along the way and, although still pleasant country, much of it was along dead straight roads for many mile between settlements, and mostly with a cold headwind. It was not all flat though, there were river valleys to cross with the inevitable ups and downs. The wind had dropped during the night and the morning was cool but sunny, but within an hour of hitting the road the temperature was riding and by the time I got to Pegasus Bridge, it was 21C and very pleasant indeed. Sitting having a coffee overlooking the bridge, famous as the first objective of Operation Overlord, the D-Day landings, I watched the many tourists passing back and forth, some on foot, some on bikes, motorbikes,and a group of around forty mini cars. 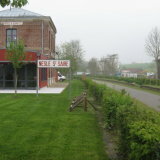 Very close to the bridge is the British War Cemetery of Ranville. 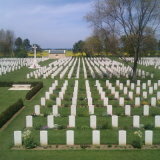 It was the first war cemetery I was to see and I found the place, with its 2,800 graves, both beautiful and at the same time moving. Immaculately maintained and in a peaceful setting, it was typical of the many such places around this area. 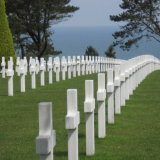 One thing that surprised me was seeing graves of German soldiers in British cemeteries. Enemies in life, but together in death! How sad and a waste of young lives. 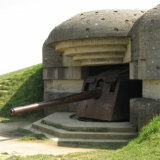 All that remained today was to find my way across the city of Caen to my bed in the suburb of Authie. It wasn't an easy task on a bike, working my way across three lane city roads, using as much as I could the excellent cycle paths. Eventually I found it. A modern house in a very pleasant, quiet area north of the city. 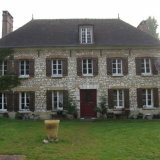 My last two nights would be spent here, a 'Chambre a Louer' which is a house where the owners 'rent out' a room to travellers. Not official B&Bs there is a network of these all across France, providing accommodation cheaper than hotels or a traditional b&b. Leaving the cemetery and heading along the coast my next stop was a roadside cafe for an al fresco lunch before moving on to Avoranches, the site of the Mullberry Harbour. The town itself is now a commercialized, tacky place. A visit to the museum up things into perspective though, with original footage of the construction of this amazing temporary harbour, completed in just two weeks following the D-Day landings. 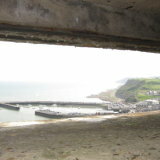 Other highlights today were some of the German gun batteries that are still intact along the coast, some showing the results of allied attacks against them. A warm sunny day from the start, reaching 22C by lunchtime. 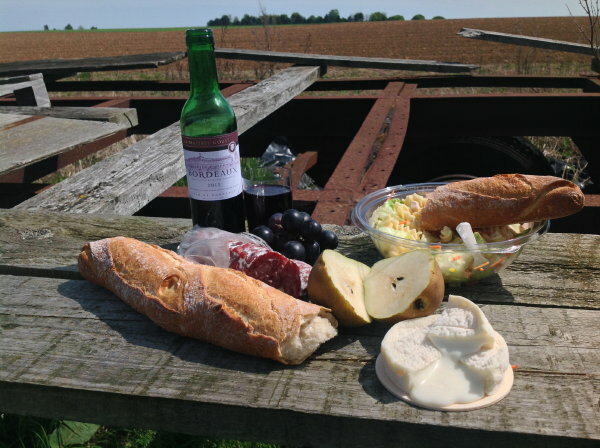 A real glorious day today, spent slowly meandering along country lanes, stopping in villages, sitting on the seashore, and enjoying a picnic of bread, cheese, salami, salad, fruit, and a couple,of glasses of red wine. My picnic being sat on an old farm trailer in the middle of a field looking out over the countryside with the blue sea in the distance - bliss! There was no rush to do anything today. My ferry home didn't leave until shortly before midnight, and it was less than 20 miles from my b&b to the port of Ouistraham. So, it was my intention to just soak up the place, going whichever way the mood took me, stopping where and when I wanted. So, after the overnight ferry and a 6-30am arrival in Portsmouth, I had a 'full English' before boarding my train to London Victoria, then a scary ride across London to Euston and the final leg home. A great trip with perfect weather. I met some lovely people along the way and saw some fantastic country, along with sights that brought home the horrors of WW2. Anyone thinking they may like to do something similar, I would be only too willing to share some of the practicalities, and give what advice I can, just ask.